Visual and mechanical Isolation and Earthing. Wide range of overload setting with no component change required. Earth leakage protection and lockout. Smart or diode pilot system. are suitable for use in Group 1 gasses atmosphere. Gate End Box can be supplied as a single unit or on a skid/trailer in a form of any configuration, to suite customer’s requirements. Available in single, double, triple, lighting and drill outlets integrations, reversing or non-reversing, ranging from 100A up to 400A, with the output voltage 110V, 220V, 550V, 1000V or 1100V. Gate End Box is equipped with backup circuit breaker/isolator with the interrupting capacity of 15kA to meet increased fault levels, incorporated with visual earth switch to satisfy need for improved protection on isolation during repairs and maintenance. The unit uses vacuum contactors to switch the load and also as a reverser, via Victor restrained sockets. 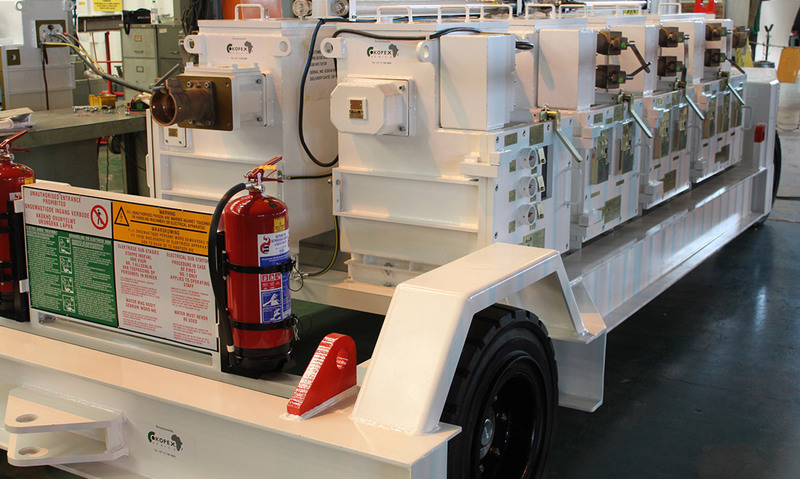 To ensure maximum reliability all power connections are bolted type, with contactors and all control system mounted on a removable chassis for ease of service and retrofitting. Each outlet is independently protected by plug in SMS II protection relay.